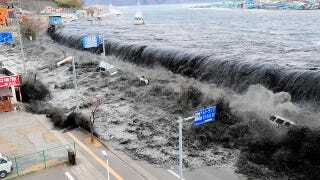 Last year's earthquake and resulting tsunami in Japan left scientists baffled. They knew that the potential for large waves was very real, but the tremendous size of the Japanese tsunami went beyond their wildest expectations — with some waves reaching as high as 20 feet. But now, scientists at Cambridge University suspect they know what happened. It looks like the massive size of the tsunami was the result of two different forces: The release of pent-up elastic energy, and gravitational energy. In a paper produced by Dan McKenzie and James Jackson, the researchers describe how the huge collapse of soft material on the seabed caused the movement of more water than should have been caused by the earthquake alone. Geologists know that tsunamis occur when an earthquake changes the shape of the sea floor in cataclysmic fashion, thus displacing the water above it. When earthquakes happen, the fault ruptures, causing the separation of rocks that have been steadily bending like a loaded spring. So, when the earthquake hits, the faults release all this stored elastic energy. The situation 70 kilometers off the coast of Japan was no different. During the 9.0 magnitude earthquake, the Pacific sea floor slid beneath Japan — subsequently causing a wave to form at the surface due to the tremendous movements down below. And as the paper notes, the process doesn't take long. All that's required is just a few seconds of tectonic activity to cause the upward and outward movement of the sea floor, by as much as 10 meters. Data from the Japanese earthquake, however, revealed an astounding shift of 60 meters! What this indicated to the researchers was that something else was going on — rocks simply cannot bend to this extent. And indeed, by collecting and interpreting seismic data both before and during the earthquake, the researchers were able to determine that the squeezing of two plates in the earth's crust resulted in a fracture and a massive collapse of debris. This debris had built up on the seabed as the tectonic movements scraped loose the sediment into an unstable wedge. As always, gravity has its way. When the wedge of material collapsed, the leading edge split off and shot forward a bit like a pip shooting out of a giant pair of tongs. In essence, what happened was a release of both the elastic energy stored in the rocks and the gravitational energy contained in the wedge-shaped build-up of debris. As a result, the extra movement enhanced the shape of the huge wave that formed at the surface. Moving forward, scientists will have to revise their notions of potential tsunami size, in areas with similar geological features. And indeed, the researchers' findings are already helping to explain other unusually large tsunamis, including those that hit Nicaragua in 1992, Sumatra in 2004, and Java in 2006. Early indications are that these events have a lot in common to the 2011 Japanese earthquake. You can read the entire study at Earth and Planetary Science Letters. Top image via Atlantic. Inset image via coastalcare, Yahoo News.